September 13, 2018, Malmö, Sweden – After two days of rain and grey skies, this morning the sun shone on the buildings and seascapes around His Holiness the Dalai Lama’s hotel. His first engagement was to meet approximately 100 Tibetans resident in Scandinavia and about 60 members of Tibet Support Groups. Before taking his seat in the room where they were waiting for him, he took time to laugh and play with the children sitting in the front. “When I arrived here in Sweden the day before yesterday,” he told the gathering, “I was tired so I took a shower and slept for 12 hours. Tagdrak Rinpoche, from whom I received many teachings, was in his 70s when I knew him and he used to complain about not getting enough sleep. It’s not a problem I have. “I’m happy to meet you all here today, Tibetans and our friends and supporters. I often point out that since the cause of Tibet is a just cause, Tibet supporters are not so much pro-Tibet as pro-justice. We continue to keep up our struggle on the basis of non-violence. Since 1974 we have not been seeking independence, but we have been seeking the rights mentioned in the Chinese constitution, rights to be implemented on the ground, not only in the Tibet Autonomous Region but in all Tibetan areas, to preserve Tibetan language and culture. In China today there are 400 million Buddhists, many of whom recognize Tibetan Buddhism as the authentic Nalanda Tradition. “Tibet, also known as the Land of Snow, is the source of water for much of Asia. Besides this, it is a place where archaeologists have found stone tools that indicate human communities lived there 35,000 years ago. “In the 7th century, when Songtsen Gampo married the Tang Princess Wenchen she brought the Jowo statue as a gift and it was placed in the Ramoche temple. When he married the Nepalese Princess Bhrikuti, she brought the Jowo Mikyo Dorje statue with her, which was placed in the Jokhang. Later, Tibetans reversed where they had been placed. “The Tibetan script that was refined at this time was based on an Indian model and as interest in Buddhism grew, Trisong Detsen looked to India for support. He invited Shantarakshita from Nalanda University to establish Buddhism in Tibet. This is how we came to adopt the Nalanda Tradition, which involves intense study of philosophy using reason and logic. Crucial to this was the translation of almost all Dignaga’s and Dharmakirti’s writings on logic and epistemology, books only preserved in Tibetan. Indeed it was Shantarakshita who encouraged the translation of Buddhist literature, mostly from Sanskrit, into Tibetan. It’s on this basis that we Tibetans have kept the Nalanda Tradition alive for more than 1000 years. His Holiness reminded the gathering that Tibetans in Tibet live in fear and anxiety. The Chinese authorities have employed all means to eliminate the Tibetan identity and to crush the Tibetan spirit, but in 70 years they have not succeeded. They talk about establishing harmony and stability, but these have to come from the heart not as a result of threats and oppression. He mentioned that Tibetans enjoy the blessings of the Protectors of the Three Families, Avalokiteshvara, Manjushri and Vajrapani. In a final remark he stressed the importance of parents ensuring their children learn to speak Tibetan, which is crucial to their developing pride in their culture. A short drive brought His Holiness to Malmö University where he was received and introduced by Birthe Müller. The Deputy Vice Chancellor, the President of the Student Union and the Pro Vice Chancellor each spoke briefly to welcome him to the University, which was described as an institution founded on human values and critical thinking. After welcoming the Lord Mayor of Malmö and his wife, Birthe Müller confirmed that it is 80 years since IM was founded and that it is presently working in 12 countries with the support of 40,000 donors. She recalled that after 12 Tibetan boys came to Denmark in 1963, 32 Tibetan girls came to IM in 1964. All of them returned to India when they had completed their training. “As you’ve mentioned, our relations have been long and useful,” His Holiness responded.”It’s now nearly 60 years since we became refugees and the 150,000 of us outside Tibet are but a handful. Nevertheless, we’ve been quite successful keeping our thousand year old traditions alive. We also engage in critical thinking. We analyse why the Buddha said what he said and if we find there is a contradiction in it we have the liberty to reject even the Buddha’s words. In preserving the knowledge that originated in India we have received immense help from the Government of India, especially from its first Prime Minister, Pandit Nehru. “We have our own language with its own script and we have a rich understanding of the workings of the mind. We’ve also preserved philosophical ideas similar to those expressed in quantum physics, which state that nothing exists objectively and all things depend on the observer. However, I’ve found that quantum physics has little to tell us about the observer although our Buddhist traditions have plenty to say. His Holiness explained that where basic human values have been neglected by an education system with materialistic goals, we need secular ethics. He pointed out that many problems facing human beings today are of our own making. He observed that while he and the audience were comfortably at peace, elsewhere in the world people were fighting and killing each other in the name of religion. Meanwhile, one billion of the seven billion people alive today declare they have no interest in religion. He asserted that there was a clear need to restore respect for basic human values, without reference to any specific religious tradition, if we want to create a more peaceful world. In answering questions from the audience His Holiness confirmed that change begins with individuals. He spoke of his hopes that the qualities he admires in the European Union of putting the common interest ahead of narrow national concerns could be repeated in Africa with the aim of developing agriculture and education. He voiced a dream he has of using solar power in the Sahara Desert to drive desalination plants to produce clean water from the sea that could be used to green the desert. He described another dream of the demilitarization of the world, noting that Sweden is one of several countries involved in the arms trade and that weapons have no other use than to kill and maim. In relation to intolerance His Holiness observed that negative emotions like anger cloud our ability to use our intelligence clearly. When asked who defines ethics he replied that in general actions that result in misery are regarded as unwholesome and negative, while those that give rise to joy are considered positive and wholesome. The session came to an end with Birthe Müller thanking the students for their questions and expressing gratitude to His Holiness for spending time with them. From the University it was a short drive to Malmö City Hall where His Holiness gave two short interviews before lunch. The first was with Fredrik Skavlan, the most prominent talk show host on Scandinavian television. He asked His Holiness to describe what he does after waking up early in the morning. His Holiness told him that for Tibetans in exile education has been very important. Not only have schools been established, but in the monastic institutions education has ensured that new generations of scholars have been trained, including scholarly nuns too, who preserve the ancient knowledge that Tibetans received from India. His Holiness explained how, when he was young, his curiosity led him to dismantle his toys to see how they worked and to reassemble a movie projector to make it work. He conceded, however, that he does not have a mobile phone. The second interview was conducted by Johanna Saldert who writes for a feature magazine called DI-Weekend. She began by asking His Holiness to tell her about his brothers and sisters and how many were still living. He added to his answers that he considers all human beings to be his brothers and sisters and that differences between them of nationality, race and faith are only of secondary importance. On that basis he feels close to everyone, so he does not feel lonely. Saldert asked him why he is so popular and he speculated that it may be because he comes from the mysterious land of Tibet. When she asked if he had ever wanted to live an ordinary life, His Holiness told her that, although he was treated with great formality when placed on the throne, he appreciated that when it came to his studies he was treated like any other monk. He confirmed that he told the editor of Paris Vogue magazine that it was quite possible for the next Dalai Lama to be a woman if that’s what would be most effective. 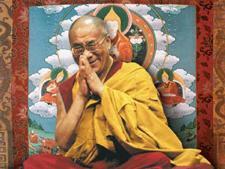 But he cautioned that it was not yet clear that the institution of Dalai Lamas would continue. A meeting of Tibetan spiritual leaders is to take place in late November to discuss this very question. Saldert wanted to know if His Holiness cries and he told he does, especially when he thinks about great compassion. He told her that every day when thinks about the awakening mind of bodhichitta it moves him in a way that brings happiness and courage. After a brief meeting with the Mayor of Malmö, city councillors and IM board members, they and His Holiness were invited to lunch to celebrate IM’s 80th anniversary. At the end Birthe Müller presented a gift from IM’s fair-trade catalogue to the Mayor and a humanium metal watch to His Holiness. 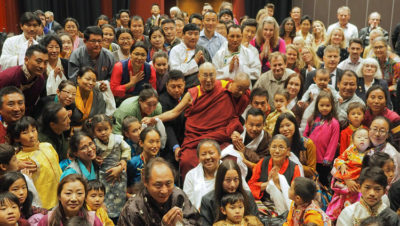 After posing for photographs with various groups of people, His Holiness returned to his hotel. Tomorrow, he will travel to Rotterdam in the Netherlands.